Spring is almost here, and you’ll be able to easily get your hands on some fresh vegetables soon. If you’re living in an area with warm weather, or perhaps near a farmer’s market, then you shouldn’t wait. 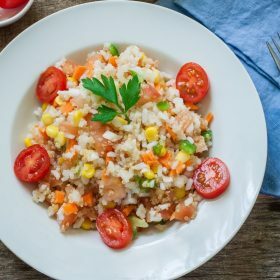 Check out another risotto recipe we have dug up from our archives: Risotto with Vegetables. As I’ve mentioned, this is perfect for spring so you can have a lot of fresh veggies to choose from. Not only that, this is also the perfect fare for those who are getting ready for the Lent season. This dish is not only colorfully pleasant to look at, but it’s also chock-full of vitamins, minerals, and all kinds of nutrients. The tomato, just like any fruit, is a good source of vitamin C. Also considered a wonder fruit, it also has other nutrients such as beta carotene, lycopene, carotenoids, and all kinds of antioxidants. Now, carrots, aside from beta-carotene, also has potassium, fiber, and vitamins A, C, and K. Meanwhile, spinach is a great source of vitamins K and A. And celery, zucchini, and eggplant are good sources of fiber, and various vitamins and minerals. Of course, rice also has its health benefits. Since it’s full of carbohydrates, it can give you a ton of energy, perfect fuel for a full day of either physical labor or brain work. Don’t you think? Not to mention, Parmesan cheese doesn’t just add a deliciously creamy texture to the whole thing, but also a ton of calcium. And then, butter also has a good supply of good fatty acids. Yes, expect this dish to be a powerhouse of health benefits. 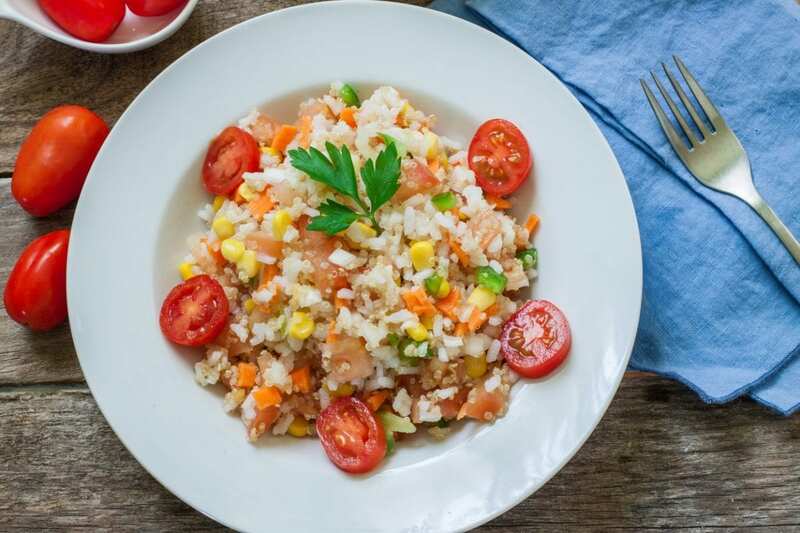 The key ingredient to this dish are fresh vegetables. So if you feel the need to, you can replace some of the vegetables, or add more, to this recipe. Now that we’ve established why this recipe is a spectacular idea, let’s get to the fun part, shall we? Remove tomato skin and seeds, and cut into cubes. Chop the celery, onion, and carrot. Also, cut the rest of the vegetables (zucchini, eggplant, and peppers) into cubes. In a frying pan, heat the oil and add garlic. When cooked, remove the garlic and set aside. Fry the tomatoes for a few minutes. Then, add the pepper, eggplant and zucchini. Remove from pan, drain, and keep warm. In a saucepan, saute the butter with the chopped celery, carrot and onion. Add the rice and toast it for a few minutes. Then, moisten the mixture with wine. When the wine has evaporated, add the hot broth one ladle at a time. Remove from heat and add a generous amount of pepper and transfer in a warm serving dish. Mix the cooked vegetables that was previously set aside, the grated Parmesan cheese, and a dash of chopped parsley. Serve separately. After this hearty dish, you can clinch the meal with a slice of delicious authentic Italian Tiramisu. Buon appetito! 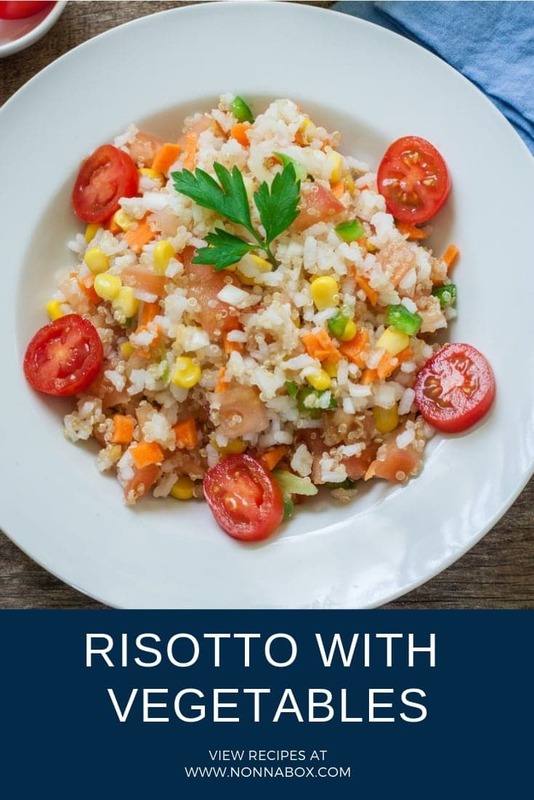 Since my husband had a mild stroke the doctor lessen his rice and meat dish consumption so I looked for another meal to cook and I was glad I found this risotto with a vegetable recipe. It is like a meal in one.